Misc: 3 BBR, 3 BA Beachfront Property with 1,755+/- sq. 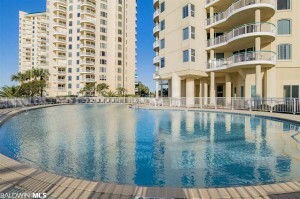 ft.
Beach Colony condo for sale in Perdido Key Florida. Gorgeous views of the white-sand beaches and the warm emerald waters of the Gulf of Mexico from this spacious condominium home featuring custom wood plantation shutters, solid-surface counter-tops, eat-in kitchen w/separate pantry closet. The master suite has breathtaking views with floor-to-ceiling glass doors – master bath includes double-vanities, jetted-tub with separate shower. With only 4 residences per floor, Beach Colony offers a total resort experience with resort-style amenities such as indoor & outdoor pools, hot-tub/spa, tennis courts, workout facility and more…. This entry was posted in Florida Panhandle and tagged 30a, destin, fort walton beach, panama city beach, Pensacola Beach, perdido key, south walton. Bookmark the permalink.